Research Area: The Relationship between NF-kB and its Inhibitor IkB-zeta Studied via Site Specific Chemoenzymatic Biojunjugation of IkB-zeta and GFP. 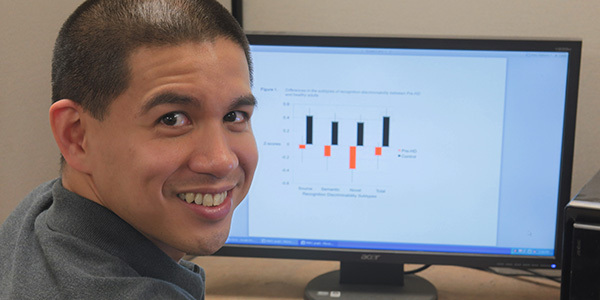 Charles Moreno was appointed as a MARC fellow June 2014. He is a former Marine and his major is Psychology with a minor in Statistics. He is conducting research under the direction of Dr. Paul Gilbert at the Center for Healthy Aging and Neurodegenerative Disease Research. His project is designed to assess differences in cognitive abilities based on sexual orientation. Individuals identifying as gay, lesbian and straight will complete a battery of standardized neuropsychological tests to assess various cognitive domains. In addition, he is a mentor for the SDSU Psychology Mentoring Outreach and Education (PsyMORE) Program designed to help students progress through college via mentorship, guidance and education. Charles also volunteers as a Domestic Violence Victim Advocate (DVVA) at the Center of Community Solutions, a non-profit organization and resource for survivors of domestic violence and sexual assault. Ultimately, he will be applying to Ph.D. programs in clinical psychology focused on human sexuality and/or neuropsychology. © 2019 Center for the Advancement of Students in Academia, San Diego State University.